Club Penguin Cheats by Mimo777 Club Penguin Cheats by Mimo777: New 2010 April's Club Penguin Mission Sneak Peek! No. Sorry. But wouldn't that be nice?! We have just been sitting here this morning eating our waffles, cereal, muffins and toast wondering when the new Club Penguin Mission will be coming out. - In February, Club Penguin said vaguely the new mission is a "couple of months" away. - Herbert wants to get our puffles! - Herbert dropped a package of seeds at the end of the last mission! Some people think that desk in the sneak peek is the same desk in mine. Personally I don't think it is. Look closely at it. It doesn't look exactly like it. What do you think? Click here to see the first new Mission Sneak Peek. So let's start another campaign! Let's ask Billybob and Club Penguin for another Mission Sneak Peak! Dear Billybob and Club Penguin, please give us some more info on the next mission, PLEASE! We love you! Leave a comment nicely asking Billybob and Club Penguin for more info! Let's try to get 2,000 comments and they might do it! Remember the language box we asked them to change and they did!? Click here to look back at that! Rock out on Franktown Rocks! Come on club penguin please gives a sneak peek we just would like to figure some things out and thank you. Please Billybob, we REALLY want to see the new mission sneak peaks. Hi billybob, as mimo said it would be AWESOME if you guys could get the mission out THIS month!! That was be AWESOME! Thank you!! give us another sneak peak of the new mission! Please!!!!! Please?! We really want a new sneak peak! What would Herbert want with the seeds?! I've got nothing! Listen to your fans at CPG and please post another clue! 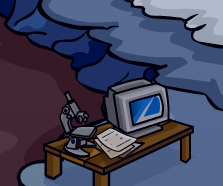 Please club penguin please post another hint we need it! Please club penguin it would be awsome if you could give us another sneak peak!!! give it to us cp! Come on club penguin please gives a sneak peek wh havent had mission 9 months. Sneak peek please! Thanks for being such a good website for little ones! ANYWAY! i rllyy want to do it i think the computer has somthing to do with it if not,its apart of somthing or an item maybe maybe it has somthing to do with g? C'mon Billybob!! give us another sneak peek of the new mission! We've benn waiting for like a bajillion years! Yes Mimo, another sneak peak would be great! PLEASE PLEASE PLEASE PLEASE PLEASE!!! SHOW US A SNEAK PEEK OF THE NEW MISSION!! P.s mimo i think i know what the seeds are for! !maybe herbert capturing puffles by planting O berry bushs!!!!! Club penguin , can you PLEASE give us a hint? and mimo, you're right. it doesnt look alike. there is no mike and that machine(which klutzy is doing something wit) is not on the mine table. you rock mimo! and cp! Billybob, Please give us a new sneak peek of mission 11. If you don't, I WILL HUNT YOU DOWN LIKE YOU'RE A LITTLE RABBIT AND, well you get the picture. Me and my friends are really waiting for a new mission. We all would like one badly. Please give us a sneak peak of the mission you are working on. Also i want the missions to be at least 30 minutes or longer. I want a long mission all the other missions are really short but they are very nice. We Please would like a new mission before May ends. In my other comment i said i would give you 3 months. I put the comment in Feb and so the mission should be ready by the end of May ok? Please Billbob(and the others working on the mission if they are any)we all want a new mission. Please,please,please give us another sneak peek of the new mission! Dear Billybob,Can You please give us more sneak peeks on the new mission? Give us more sneak peaks, your the best billy bob and you rock!!! Thanks so much for making club penguin cool. Keep on making club penguin fun! yeah billybob. please? ok guys, i have said it once and i'll say it again. all those complicated and well thought out mission theories out there? well chances are that they are wrong. every time we have a clue u come up with these complex theories which are really cool but then it turns out to be something simple. Dear Billybob and Club Penguin, please give us some more info on the next mission, PLEASE! Even better they could put in the new mission a lot earlyer! billybob, plz give us another sneak peak! Please give us another sneak peek Billybob! Don't people plant seeds in SPRING? Hi Billybob, please give us a sneak peek of the mission! Club Penguin is doing AMAZING! please billybob! please give us some more info about the new mission! we love you! and cp! thanks! Please Billybob? We are all waiting for a mission sneak peak. We wanna know if the seeds were important. Will he think the orange puffle is gold now? Will he brainwash fluffy fish to take him to Zippo the penguin? Please Billybob! It would make you even more of a hero to us! Good point! I think you're on to something! Please, CP Team?! Give us another hint! 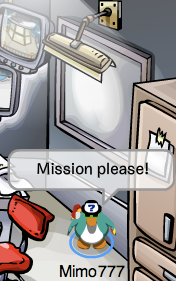 Cmon CP please can we have the new mission sneak peek pronto? Please? Please? Please? Double please? Triple please? WE really want more info or sneak peeks about the new mission. Please show us another sneak peak Billybob. Hey Billybob, herd your a fan of the site! So, since there was no Saint Patrick's day party, everyone was sad... Cheer them up with a mission coming out sooner than what you guys said. I know your trying to make Clubpenguin Bug-free, but it seems pretty good right now, so put it aside and work on the mission. -48th comment on the petition! CMON LANE (BILLYBOB) GIVE US A SNEAK PEAK + U SAID THE THINGS ARE GONNA START COMING EARLY! Please billybob Please show us another new mission sneek peak! Please give us a clue to what the new mission is? Please BillyBob, we REALLY want to see another sneak peak! Please! We are begging you! Please Billybob! We want our new mission! How can agents keep the island safe? They need training, and the missions help the agents keep the island safe, and get rid of the bad old Herbert! Please Billybob! We looooooooove CP! We Love the Club Penguin team and everyone in it! Please billybob get us that new mission soon!!! Billybob, it's been forever since there has been a new mission! And the last one had a real cliffhanger! Please give us another sneak peak! Please give us more info about the new mission. billybob give us mission news plz! Billybob is a weird name you should change it to something more official J.K. No really, We need more mission hints... REALLY! i help u out mimo as u are the best should i just comment or email. new sneak peek! new sneak peek! please? with a cherry on top? hi billybob and mimo that sounds awesome i cant wait!!!!! We really really want to see the new mission sneak peak! Hey everyone it's my bday in 3 days, I will be on sherbet for a party on tuesday. I'm Blackdalek20 if you want to come for the party. We would really want a sneak peek of the new mission because apparently you keep on delaying our mission!!! and we are very eager to know whats the mission is about and you should make it come out as soon as possible because we cant wait any longer. pls billybob give us more info of the new mission pls! Come on, Club Penguin! If it's not too much to ask, please change the HQ mission updates sign? Thanks a lot. You guys rock! Dear Billybob, can you please give us another sneak peek to Mission 11? It would really be nice of you to do that. Please Billybob let us see another sneak peek at the new mission! We would really love it! PLEASE! PLEEASSSEEE CLUB PENGUIN WE LOVE YOU GIVE US A SNEAK PEAK!!! Hey billybob! Please give us a mission sneak peak! Lane Merrifeild please give us and mimo777 more information on the new mission we would really like it please blillybob. PLEASE give us the new mission CP! Please give us a sneekpeek Billybob. Please please please please please!!!! Billy Bob we want a sneak peek! I LOVE U!!!!!!!! Please, Give us a hint please! PLEASE GIVE US SNEAK PEEKS! Please Billybob and Please Club Penguin, Can we PLEASE have more info on the new mission? Billybob and Club Penguin, Can you please give us a sneak at the new mission or something about it? We have been waiting and everybody thinks we deserve it. Please?Thank you. New mission sneak peaks! We love you! it wasn't the chat bar. It was the language bar. Please, pretty please with cherries on top! Billybob, please tell us more about the secret mission! We are so anxious and curious! So please, tell us! Billybob we need a mission with Candance,aunt artic,or penguin band!!! PWEASE give us another mission sneak peek billybob! It has been for ever since the last mission! P.S. Mimo I'm going to get a Tootsville account before April 30th so that I can have free membership and I'm excited! My mom made me make a choice between Tootsville and Webosaurs several months ago (and I'm really happy I chose Webosaurs) and I chose Webosaurs, and now she says I can make a Toot because of the free membership thingy. She's kind of in a bad mood today... But i'm excited anyway! Give us a sneak peek!! Give us a sneek peeeeek!! Please,please give us another mission sneak peak billybob and clubpenguin! We love you! Club Penguin Support and Billybob, PLEASE SHOW US ANOTHER MISSION SNEAK PEEK! We have been waiting forever and would really appreciate it!!! Come on Billybob I love club penguin come on come on come on. Plz give us at least a date for the new mission! Plz! Could you please release a sneak peek of the next mission? I appreciate all you do. After finishing Mission 10 I was a little sad we didn't catch Herbert (All because of rookie). So I was really eager for mission 11 to come out see would could go on another adventure and hopefully catch Herbert the polar bear. However this new mission came out in JANUARY 2009 and waiting for it has been really hard. After you guys announced the mission I became real excited that after all my waiting the new mission would finally be out. However time has past and I am getting a little bit impatient. So to calm my impatientcy (is that a word?) I ask you with all my heart and soul to please at least give us a sneak peak about this mission. please billybob tell us about the new mission! keep waddleing on my freind! woops i meant everybody!! not everready lol i need to fix my spelling mistakes! woops i meant alldready!! not everready lol i need to fix my spelling mistakes! Please Please Please give us a sneak peak!! Thank you so much! We love you! We love you Billybob and the rest of CP! Well, it's already well into March, so April really isn't that far away. Still, I want the new mission too! please billy bob Please!!!!!!!!! i Beg of you!!!! Hey Billybob! Pleeeeaaasseeeee give us a sneak peek! I just want to know what's coming up! Thanks, and you rock! Hey biilybob I LOVE club penguin and I've been DYING to try the new mission! I've been waiting so long but its not coming out anytime soon, so please give us at least a small sneak peek!? Thank you!!! PLEASE GIVE US A SNEAK PEEK! Thanks! Club Penguin you rock! Dear clubpenguin please give us more info please!!!! What about the trees missing in the box demention? Does that have something to do with the mission? We have patiently waited for over a year for a mision! please billybob give us more info! maybe herbert's hacking into the PSA! does somebody here knows billybob's email? Please, very happy if you did! Post people post!!! we need more sneak peeks!! Hi Billybob,can you please give us another sneak peak at the new mission? Please? !Listen to your best fans on CPG and post another sneak peak.Oh and it would be cool to have it out in april. Waddle on Mimo and CPG gang! Please give us a new mission!All the agents are counting on you! please?! I know your trying to make Clubpenguin Bug-free, but it seems pretty good right now, so put it aside and work on the mission. I agree with him.PLEASE!btw club penguin seems all right with the bug-free thing. Mimo,remember the vote for a jackhammer that make trees? And they said it might come out around july? The packet of seeds might be for that!!! The new mission is around JULY!!!!! Billybob and The rest of the Club penguin team.Please leave us some more info of the next mission. Please Billybob! We've been waiting since what seems like FOREVER!!! Please OH Please! PLEASE Billybob, please give us more info, we'd like to know more about Herbert's plans. It won't be considered spoiler since you won't tell us everything anyway. Please Club Penguin. Please, please, please. We know your real busy, but if you give us another sneak peek, that would be great. Thanks. Waddle on. pretty please with sugar on top can we have a sneaky peaky? billy bobby? Please please please Billybob I'm dying to get another sneak peak of the next mission. Plz give us another sneak peek Billybob. We would all appreaciate it. CP is da best eva! P.S Thanx Hnwjanuary11, Toysgoneby and Fluffygood for being my friends on CP! All of us here would like to have atleast ONE more sneak peek at the new mission. 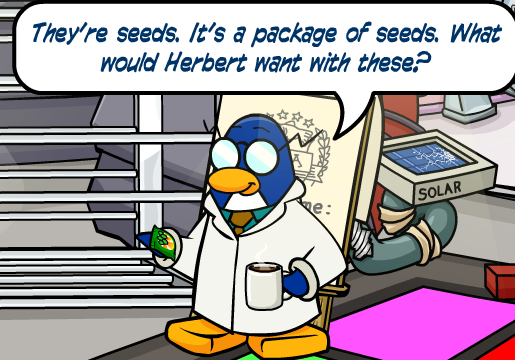 All we pretty much need is only one of why herbert wanted the seeds. Billybob!please give us another sneak peak for the new club penguin misson! Please billybob! I love cp and i have 32 figures, 2 puffles, four penguin plushes and nine puffles! i really want another mission!!! i do them all as soon as they come out! Yeah, we really really want to see another sneak peak Club Penguin! we've waited so long for this mission to come out!! That would be awesome Billybob! Plz i can not wait! Also I saw the video of you giving better a tour your hangout plz is awesome that is like the ultimate HANGOUT!!! 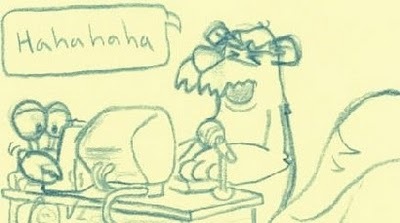 As you might notice, we all at CP Gang want you to put up a few more sneak peeks for Mission 11: "Herbert's Revenge." Well, I'm not begging but we just want to see a little bit more of what it's about. P.S. You might know me as Clownybrowny on Club Penguin. Oh cmon PLEASE Billybob? Give us a sneak peek please. Please. Double please. Triple please. Quadruple please.How are we gonna stop Herbert and Klutzy if we don't have one? The population of puffles could be in serious trouble! Wait, cut that- the who ISLAND could be in trouble. So please. Pretty please with a cherry on top. We need to have a sneak peek! CMON BILLYBOB AND CP! GIVE MORE INFO! BillyBob we love your last missions and we want more about this one PLEASE tell us! Please please give us a sneak peak cp!! Yup. That's the mine desk. Please Club penguin give us another sneak peak of the new mission! Please Billybob, its been almost a year since a new missions been out on Club Penguin. We dont't want our exitment bottled in. Come on penguin mods, please do it sooner or give another sneek peek. Umm... Mimo I think the missions they were talking about are in the new DS game. please! i would really like some info on the new mission 10! it would be great! Please Billybob I, We have finished the other missions!!!!!! i have been counting down the days for a brand new mission. i was even marking the family calendar. Please Billybob, I'm dieing for another peak! PLEASE? Do it for us and Mimo.